The custom built, 31 ft. Mary Sea was constructed in 2003 in Steuben, Maine. Its streamlined form is reminiscent of a Maine lobster boat, and meshes functionality and complete comfort to ensure the best possible Martha’s Vineyard charter fishing adventure. 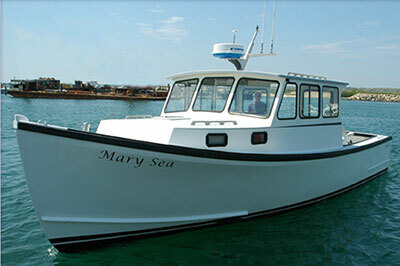 Our Menemsha charter fishing trips aboard the Mary Sea are a true Martha’s Vineyard fishing experience. Our Martha’s Vineyard fishing boat is equipped with state of the art marine instruments, top shelf fishing tackle, a fully enclosed cabin, fighting chairs, and plenty of seating inside and out for everyone in your party. Check out our Martha’s Vineyard Charter Fishing Rates! The Mary Sea is a fully equipped Coast Guard licensed vessel. Check out our photo gallery of people fishing and the fish they caught aboard the Mary Sea! Book a Martha’s Vineyard fishing charter today by phone or email and we will get you hooked on a fish!